Product description: Our Complete Leather Repair Kit features our top-rated leather repair and leather touch-up products online. Learn more here! Get both the Leather Repair Kit and the Leather Repair Touch Up Kit with our Complete Leather Repair Kit, ideal for tackling a range of minor repairs. For even the most cautious among us, damage will inevitably occur to our leather possessions – whether it’s in the form of a cat scratch to a leather sofa, or tears and holes in a car’s interior from normal wear and tear. Who would have thought that purchasing a leather repair product online would be a more practical option than hiring a repair service, or purchasing new? Well, for starters – we did, which is why we designed a solution that provides professional results on a budget. This product is suitable for areas no larger than a tennis ball. For areas that are larger than a tennis ball, our Leather Colorant Kit is recommended to ensure that you will have enough color product. The Complete Leather Repair Kit is suitable for use on leather items with small areas of damage of all types listed in the product description, on furniture, car interiors, shoes, handbags and clothing. 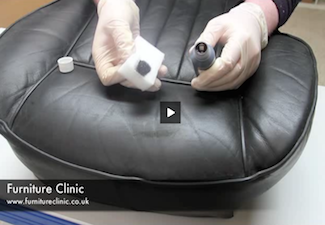 The products provided in the Complete Leather Repair Kit are sufficient for the repair of several small areas of damage, or around 4-5 small rips or cigarette burns for example, for larger areas of damage the coverage will be reduced as would be expected. The coverage the Complete Leather Repair Kit will provide depends entirely on the size and type of the damage it is used for, typically the kit includes enough to deal with many instances of minor damage such as small scratches or scuffs, but may only cover one or two larger areas of wear or staining. For larger areas use the Leather Colorant Kit. All items should be stored in a cool, dry place with the lids tightly fastened, they should not be stored at temperatures below 39ºF. Following these instructions the products in the kit will last for years without any decline in performance. This is the first step in making a repair and is easier than you think! Select the color that best matches your leather when you place your order. This will give you a kit with a pre-matched color that will be a close color to your leather. You can then mix in the tints that come in each kit to make it match perfectly. Simply select the color that best matches your leather. You can then match all shades of this color with the kit from light to dark. For example, the Cream kit can be tinted to match every shade of Cream and the kit will also come with tints to match different types of Cream - you can add a little Red to make the Cream more Rose/Pink. Yellow will make it a brighter, more Yellowy Cream and White will make it pale. Add Black to darken it or turn it into Beige. Basically, each kit comes with the right tints to match a huge spectrum of similar colors! I had watched the video on youtube first, showing how to repair a hole in leather, before I ordered this product. It arrived quickly, and I was impressed with all the components of the kit. I carefully followed the clear instructions and have to say I'm really impressed with the results I've achieved on a rather nasty tear and hole on a dining room chair. The colour matching kit allowed me to mix the exact colour. It has surpassed my expectation. Tip follow the instructions and don't rush through the stages, patience is the key to getting the desired result. My two dark brown leather couches and office chair were in need of being touched up. The color was coming off from the seat cushions. I was afraid to use the kit as I was not sure about matching the color and how it would look or if it would soak in and leave a noticeable difference. I used the brown without changing anything and it looks great and the liquid dries right in after a minute or so. What a HUGE difference it made - I had to dab it on with the sponge as it would not cover the faded spots if I tried to rub it in. This product saved my expensive furniture and really restored it back to how it should look. I feel more confident about the product and will tackle the leather seats in my car next!! Thank you so much for a great product. I couldn't be more happier.